Sanjay's Super Team (directed by Sanjay Patel) is Disney·Pixar's latest short film offering, released just last month in front of The Good Dinosaur. To coincide with the film in theaters, the Disney Store released this adorable Sanjay plush- available for a limited time! 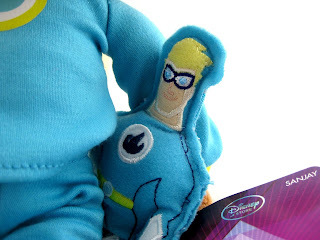 The likeness here is really spot on with detailed embroidered features. I love the inclusion of his little super hero action figure that he's holding as well! Additionally, the plush is a nice size (bigger than I expected), standing at about 16" tall. 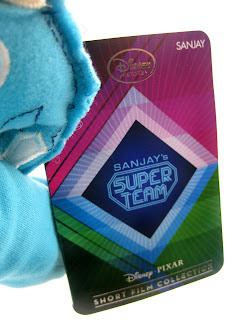 As shown on the tag, this is part of the official "Disney·Pixar Short Film Collection"- which is very neat. It's a rare treat to get merch based on a Pixar short film, so I jumped on chance to get this. 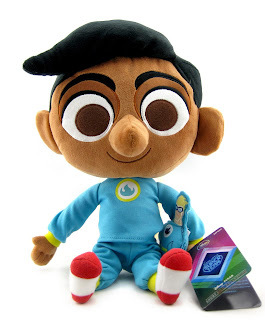 Short film items are usually in the form of a plush like this (exclusive to the Disney Store or the Pixar Studio Store) and once they're gone, they're gone. Without fail, once they're sold out they become hard to find and highly sought after. If you enjoyed the short, don't miss your chance to get this great item while it's still around! Be sure to pick yours up today HERE!